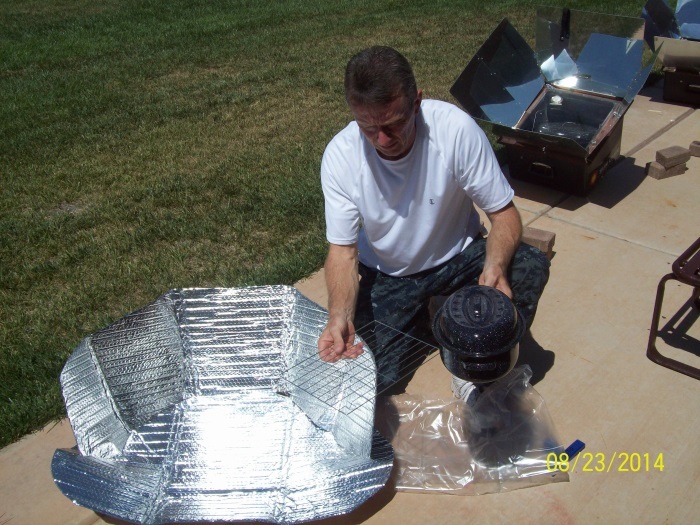 The Shahjee Solar Stove was invented and produced here in the United States by Athar Shah of Antelope, California when he and his engineer father perceived a need for a sustainable and effective method of cooking food, especially in countries where resources and money are scarce. 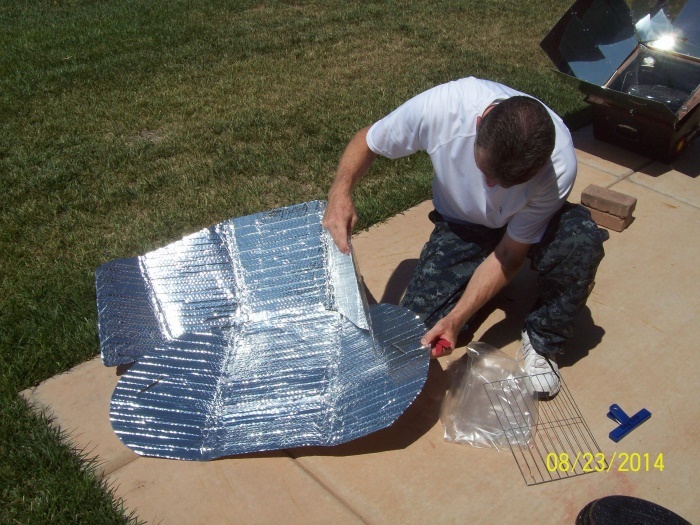 This Solar Stove is very similar in design to a number of other panel style solar cookers that are available on the market. The design reminds one of the venerable and widely disseminated Cookit that was first created and utilized in large numbers around the world by Solar Cookers International. The main difference here though is the material used in this cooker is a bit lighter in weight and is more weather resistant compared to the cardboard base foundations such as which the Cookit , and other panel cookers, have so famously used. 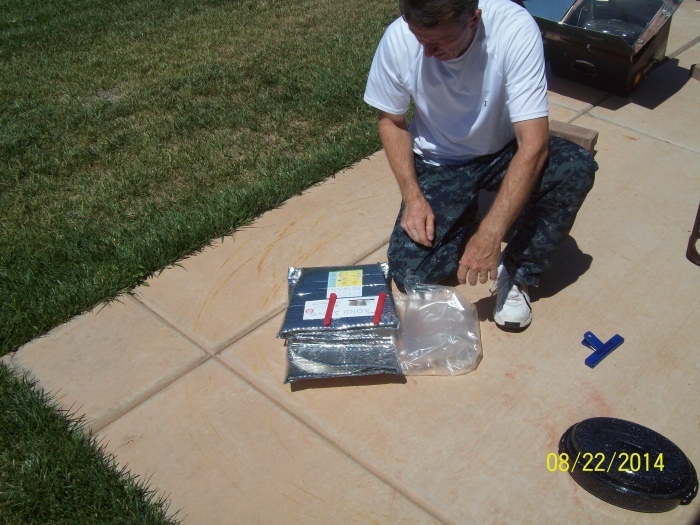 Placing pot onto grate (trivet) to then place inside of included oven roasting bag. The Shahjee Solar Stove comes with a couple of accessories, but the dark colored cooking pot is not one of the items. These can usually be found in thrift stores or in variety stores that carry cookware. The cook pots need to be dark in color to better absorb heat, and thin in order transfer heat to the food more quickly. 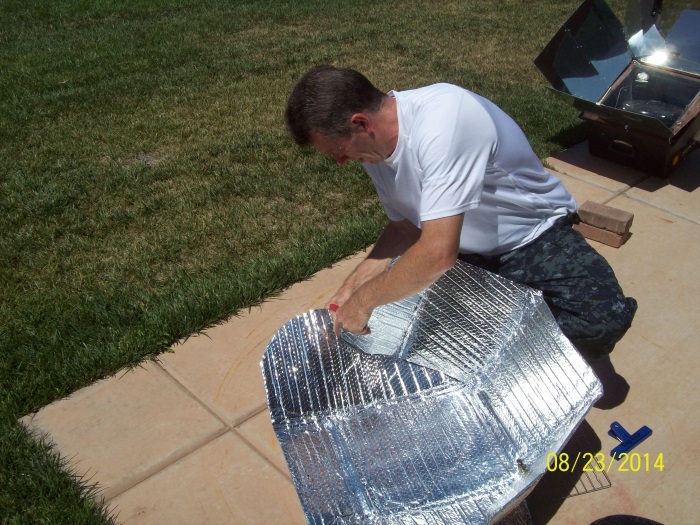 Enamelware (speckleware, or stoneware) is a great pot for solar cooking, but any dark colored pot or pan will do. The kit does include two roasting bags, two panel securing sticks and a grate to be used as a trivet to keep the pot pan from resting on the bottom of the cooking bag and to allow for circulation of the heated air underneath the pan. Of course the cooking pot you use will not be quite as compact, but you can find one to suit your own particular needs and use. 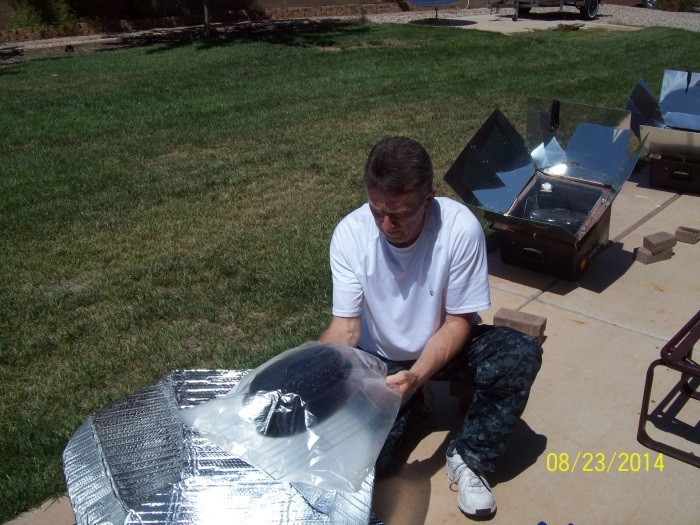 The reflector panels on this particular cooker are quite large and wide open allowing for the ability to capture and concentrate a good amount of the sun's rays onto your cooking pot. This also allows for some pretty "hands-off" cooking since the design of the panels does not require a lot of continual refocusing (re-orienting) of the cooker towards the sun. Of course this can vary throughout the year, depending on time of day and the time of year and location of the sun. Final assembled state of Shajee Cooker with pot inside of bag. and the cooker is of a material quality that, if taken care of, will give a number of years of effective and reliable solar cooking. 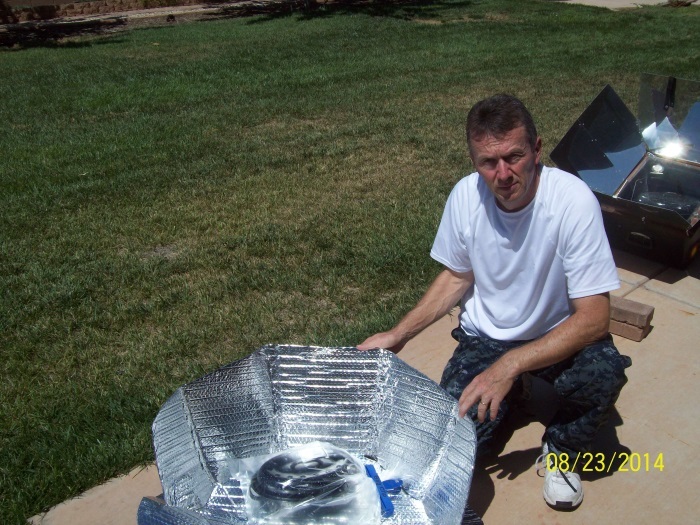 This solar cooker can be used as a principal cooker or to augment and supplement your commercial box and panel solar cookers in order to have additional and increased cooking capacity. There is the Shahjee Solar Stove original version which has no border or lining, which cooks as effectively as the trimmed cooker. Then there is the border lined, or trimmed version known as the Shahjee Solar Stove 2.0 which looks a little more professional and has an added sturdiness and rigidity to the cooker. Both cookers will cook quite effectively.